I recently joined the advisory board for The Open Source Business Resource (OSBR) which is one of my favorite reads when it comes to crossroads of open source and business. I find that when it comes to quality business-related open source material out there, we don’t have many options (or I’m just not aware of them yet). I mean, besides opensource.com, a couple analyst firms and a few interesting blogs, I don’t have much to go on. If you haven’t noticed, the mobile industry is in an open renaissance when it comes to giving people access to source and allowing them to contribute via a variety of levels. For those who had the pleasure to work in mobile in the past, this is a bit shocking given how the industry previously treated access to mobile operating system source. 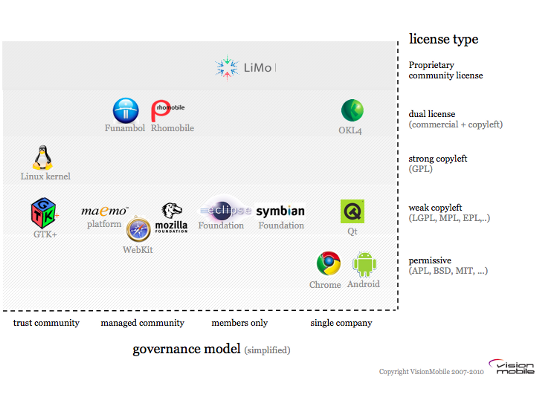 The important part of the article is when it starts mapping open source license types to governance models (see the fairly accurate figure below). And discusses how the mobile industry needs less marketing hype around the benefits of openness, but more education and clarity on governance models. See where Eclipse fits in (it’s snuggling next to Symbian)? Do people like it there :)? Just because Android says they are open, doesn’t necessarily mean they are when it comes to governance. Anyways, give the latest OSBR issue a read if the mobile industry is your cup of tea. If you want to see anything in upcoming issues, like a potential theme covered, please let me know.